One of the benefits to The Reserve at Lake Keowee is its proximity to Clemson University—just a short 20-minute drive—which makes it quite popular with Clemson alumni, as well as families with children enrolled at the college. Likewise, The Reserve has become popular with Clemson University, in particular the football team, which often holds its July Media Day event at our golf course and clubhouse. 2017 was no different. 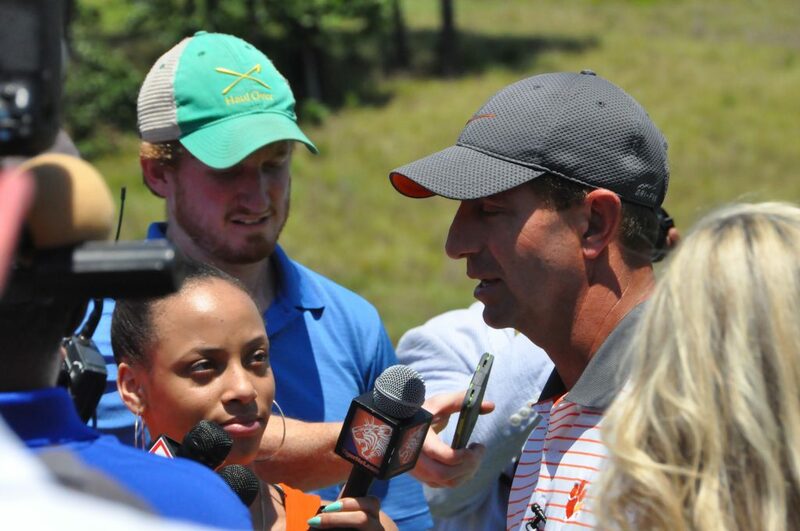 Dabo Swinney and crew were on site today to host the annual Football Media Day and Golf Outing, highlighted by a round of golf on The Reserve’s award-winning Jack Nicklaus Signature Golf Course. In addition to great golf and beautiful summer weather, participants were privileged to hear the University’s plans and programs for the upcoming football season. Of particular importance were the candid interviews and discussions between the coaches and members of the media. Dabo and several coaches were in attendance to address how the National Championship has impacted the program, and how that has fueled expectations for the coming season. The press on-hand included writers and journalists from across the state and throughout the ACC region, at large.